The Space-saving Lundia Mobile Shelving Systems are customised for your specific requirements. This is of particular benefit for educational facilities and businesses with large storage requirements. Lundia Rotadrive is a customised, mechanically assisted system which allows users to move huge amounts of fully laden shelves smoothly and easily. Each shelf can hold up to 200kg and with a huge capacity of 5000kg per Rotadrive carriage, the space saving design allows for a massive amount of storage occupying the smallest of spaces. 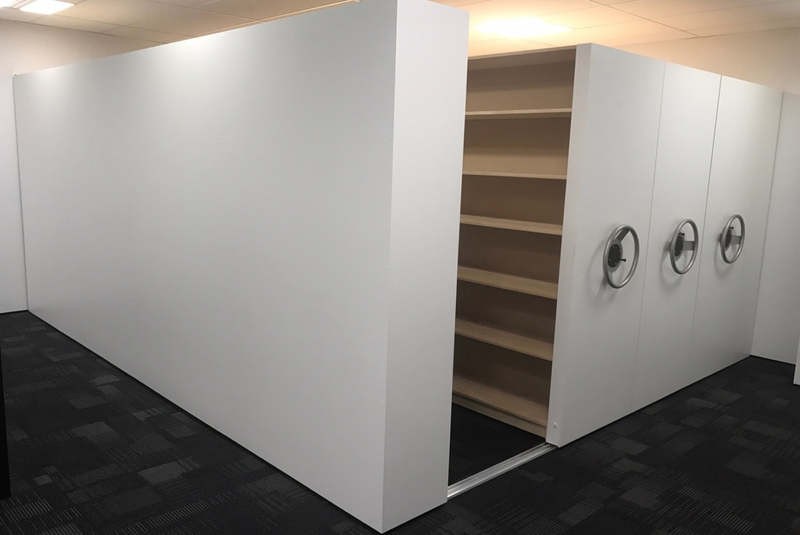 The Lundia Mobile system also ensures optimisation of floor space, providing space savings of up to 50% over conventional shelving systems. Lundia Mobile shelving is built from plantation-grown, sustainably harvested Radiata Pine. Mobile units in natural timber finish with Melteca ends.